Over the last couple of years, in my current job, I’ve been learning about project management. I’ve taken courses at work, watched webinars, asked people questions…it’s just been non-stop learning lately. Early on I learned the importance of gathering requirements in the early stages of the project. Doing so saves you a ton of work later on when you discover something you should have known before you hit the ground running! The same applies to dating. When you’re getting to know someone new, you can save yourself the frustration later on by asking questions up front and letting it be known what your requirements are and what theirs are as well. Duh, you already knew that, right…but let’s be honest, we rarely have these conversations or requirement meetings because we get caught up! Things are going well, we really, really like the person…and then a shift happens. They say or do something and you’re like whoa, that’s what you think or how you feel? Had we taken the time to investigate these things we would have known that they didn’t want children, or they want to move within a year, or they’re not really looking for a commitment…you get the picture! 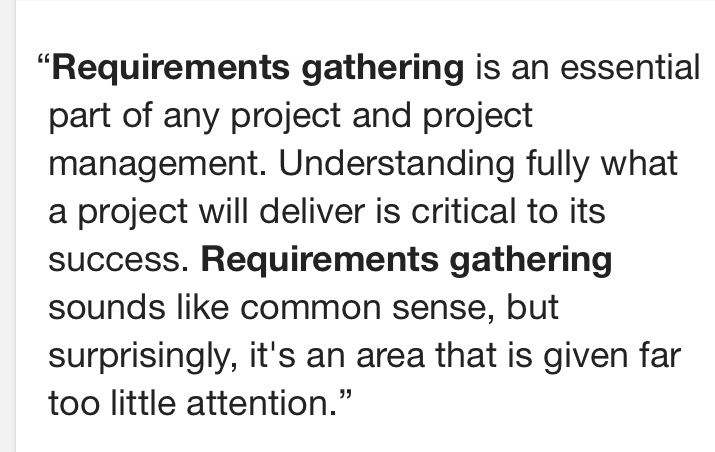 I saw this when I googled “requirements gathering” and it is so very true! It sounds like common sense, but is given far too little attention. My advice is to slow down, ask the right questions, really get to know the person…basically gather your requirements early on! Doing so will save you potential heartbreak! As someone who’s done project management I got a kick out of this title and I like this approach to writing about dating. Clever!